To support permitted geological teams by collecting data in the forms of survey maps, observations, water/mineral samples and detailed video and photography. 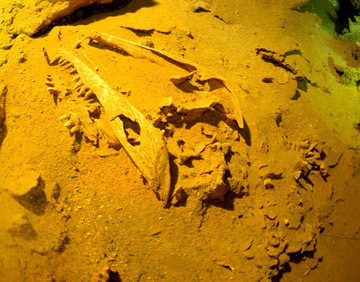 To support permitted archeological / paleontology teams for underwater artifact documentation consisting of, but not limited to photography and videography. 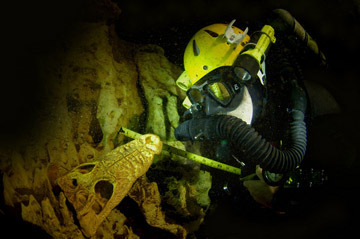 To support permitted archeological / paleontology teams for underwater artifact recovery, record keeping and preservation. To support permitted biological and scientific teams with underwater specimen collection, documentation, and recovery. 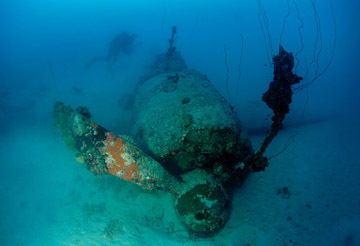 To survey and document undiscovered caves, shipwrecks, and reefs. Second: Other Agencies working with AEF. For every diving event, an overall event leader – titled as the Appointed Dive Event Leader (ADL) – will be appointed by the PD. 1. Ensuring that all dive team members, equipment, and surface support are properly coordinated to complete the agenda of all given dives during the event. 2. Providing a verbal debriefing of the dive(s) to the PD subsequent to the dive. However, the time of the debriefing will be estimated by the ADL and communicated to the PD so that an expectation of dive completion can be established. 3. Unless agreed upon to the contrary in advance of the event, the ADL will be responsible for collecting data from all team members. For each dive, every diver will be classified and operate within the limitation of that classification. These classifications are both a "qualification" level and a per-dive operating level. This means that each diver must be signed off through each level. See the Diver Qualifications document provided. 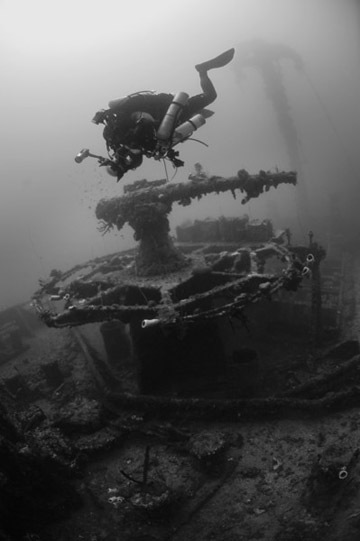 Input is implicitly supported from all project members throughout the course of planning and execution of all dives. When a consensus cannot be reached, final strategic dive-related decisions will be made by the ADL and ratified by the PD. Any public relations statements will be made by the PD. Although this may seem obvious, AEF must emphasize that membership in a project carries significant responsibility, not only to the other project members, but also more importantly to the public and the diving community. Our individual actions and behavior will reflect not only on ourselves but also on AEF and the diving community. As a project member, one must consider oneself as a representative of all of these groups and hold oneself to a highest level of professionalism. This is especially critical with any media attention. It is imperative that we do our utmost to present diving in a positive and productive light when discussing the project with others – especially the media. This attitude is to take pre-eminence over the desire to tell tales of personal glories. These dive event dates will be scheduled as much in advance as is practical. • All Divers must have their Drivers license available and current emergency contact information and check in with the ADL and on file with AEF. • There will be no littering, open fires, or destruction/damage of flora or fauna (excepting mosquitoes). 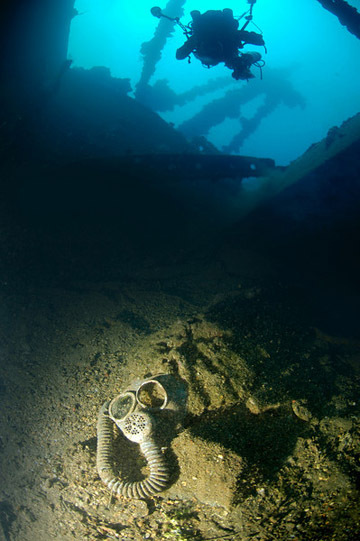 • For any dive event where there is more than one team diving, there will be at least one individual that will remain on surface to act as the “Surface Support Coordinator” – this person will be aware of the entire, detailed dive plan, including decompression and expected time to surface. If there is only one team, a Surface Support Coordinator is not required. • The PD will assign individuals specific tasks to be completed to achieve a goal. Two “decals” will placed horizontally on each side of the bottle, carrying in LARGE letters the maximum operating depth for the mix, based on PO2 constraints (e.g. "120" would appear on the side of an EAN 32 deco bottle). The "decal" can be in the form of strips of duct tape, sticker-numbers, or stenciled numbers. The intent is for this decal to be easily read by team members. All Divers must follow the gas requirements listed below for bottom gas and deco gas. Gases must be re-tested on the day the cylinder will be placed in the water. *Max. O2% means this is the maximum oxygen percentage you can use for the dive. **Min. He% means this is the minimum helium percentage you can use for the dive. You can use more helium if desired. accordingly and extra of each gas must be available onsite for each event. *These MODs must be marked on the bottle (see Bottle Labeling above). **O2% means this is the exact oxygen percentage you must use for the dive +/- 3%. ***Min. He% means this is the minimum helium percentage you can use for the dive. 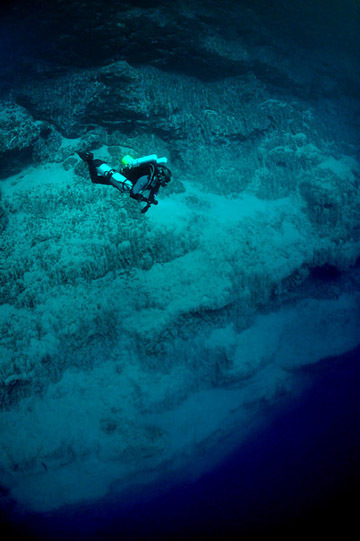 Exploration divers must take bottom gas breaks. For open circuit divers, take bottom gas breaks when you finish your last stop for a given gas before moving up to your next (higher PO2) gas. For example, take a back gas break at 80 feet before going to 70 feet and switching to a 50% mix. CC divers will have to lower their set points to perform a break. Also, exploration divers must take back gas breaks while on 100% O2. Breathe O2 for 12 minutes and back gas for 6 minutes. For exploration divers, do a break at 40 feet for 15-30 minutes before entering the habitat. All open circuit divers must dive in the Hogarthian/DIR style configuration on all dives. • The primary second stage on doubles will be breathed off the long hose (7'), which shall be wrapped around the neck in the Hogarthian fashion. The primary regulator will be mounted on the post above the right shoulder. • The back-up regulator (octopus) must be retained by a neck strap (necklace). • Back up lights shall be clipped to the chest straps of the harness or placed in a pocket on your exposure suit. • No items (including surgical tubing) shall be attached to the back of double cylinders. • Primary light must be worn on the waist belt (Hogarthian style). See separate documentation regarding CC configuration. 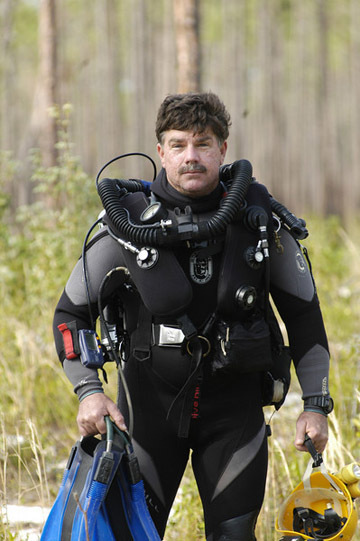 All divers diving a dry suit must inflate their suits with either argon or air. Inflating your dry suit with a helium based bottom gas is not allowed. Helium does not insulate and causes too many counter diffusion problems. All divers are responsible for their own equipment and must have everything they need to complete a dive (e.g. if your mission requires two stage bottles, you must have the equipment to do this dive). Prior to entering the water, all gases must be re-analyzed and all equipment must be checked for leaks and proper operation. If, onsite, you find that a piece of your gear is malfunctioning, you are responsible for replacing it with backup equipment that you bring. If you need to borrow a piece of equipment from another diver (such as a LP hose), the other divers on the mission must be okay with it. If you cannot get your equipment working in a safe and timely manner, you will be removed from that mission for that day. It is recommended that you bring spare equipment with you, such as extra batteries, backup lights, regulators, masks, hoses, etc.